However, the study—led by researchers at the University of Wisconsin-Madison and the Wisconsin Department of Natural Resources—reveals that reducing the amount of agricultural land immediately surrounding Wisconsin's waterways could improve water clarity by limiting nutrient runoff. It also shows most lakes have stayed the same and some are even seeing an improvement in clarity. "In the face of increasing precipitation, this analysis provides empirical support for the fact that adapting our landscape is going to be important into the future," says co-author Monica Turner, a UW-Madison professor of zoology. Specifically, limiting farming to 10 percent or less of the so-called riparian buffer zone around a lake and the streams flowing into it can improve water clarity. The riparian buffer refers to the vegetation immediately adjacent to a body of water. Implementing such actions also benefits farmers, as they suffer less damage to their croplands during heavy rains, Turner says. Using more than 25 years of data collected by citizen scientists, the DNR and the federal government, the researchers analyzed Wisconsin's lakes to identify not just trends in water clarity (an indicator of lake health) but also how the landscape and the climate interact to determine year-to-year fluctuations. While their results show water clarity in the majority of lakes has not changed and six percent of lakes are on an upward trend, the fact that more lakes are getting worse signals there is work to be done. "If we want to maintain or improve water clarity, we need to think about trends in precipitation," says lead author Kevin Rose, formerly a postdoctoral researcher at UW-Madison and now an assistant professor of freshwater ecology at Rensselaer Polytechnic Institute in New York. 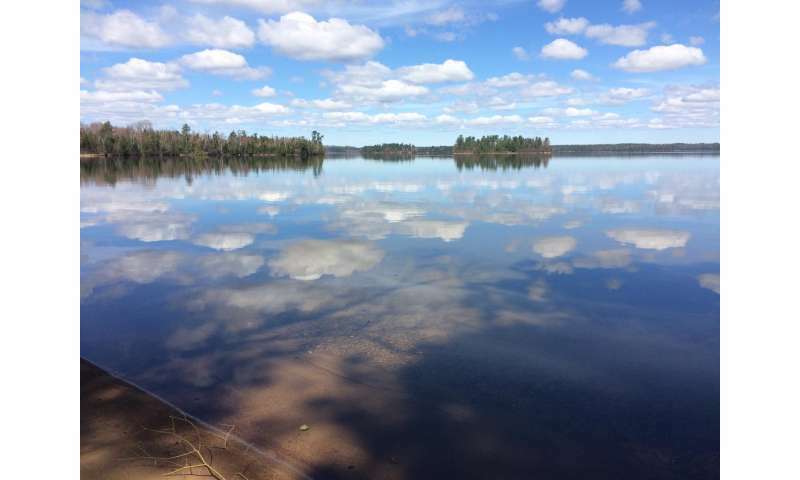 The study, published in the journal Ecological Applications, shows that wet years (like the current one) can be especially hard on lakes that typically have greater water clarity, like those found in northern Wisconsin. Clear lakes are more sensitive to the onslaught of nutrients and plant matter flushed in by the rain, which can cause water to turn murky, brown and green. Mitigating the negative impacts of more rain, however, will require managing land in ways the research team didn't expect. They approached the study thinking that what happens across an entire watershed, such as where and how the landscape is farmed, would impact water clarity, especially during wet years. While the results indicate broad-scale land use does matter during dry years, the opposite is true in years with higher precipitation, when water clarity is more dependent on how the land is managed in particular places. Namely, riparian areas with less agriculture fare better and can play a significant role in reducing nutrient runoff, Rose says. "This study provides on-the-ground evidence that is consistent with what our computer models are telling us," says Turner, referring specifically to model results produced by the Water Sustainability and Climate Project at UW-Madison. The models indicate that water quality in Wisconsin could decline as precipitation increases into the future without concrete efforts on the landscape to buffer waterways and reverse the trend. The study, Turner adds, also highlights the importance of looking ahead to anticipate how climate and landscape changes will affect Wisconsin's lakes and what we can do now to prevent future problems while also protecting Wisconsin's farming industry. "It absolutely provides evidence for the importance of continuing to look for solutions to sustain the economy of Wisconsin without sacrificing the quality of our water," she says.